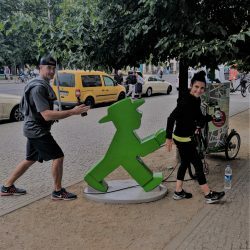 We recently got back from a trip to Berlin, Germany and I have to say I loved it!! I had absolutely no expectations going into this trip and because we were visiting our two friends Kenny and Josh, I didn’t do any research! Luckily Kenny knows I love lists and had an entire agenda planned out for us! 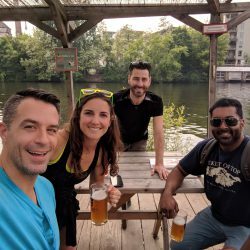 I have been to Munich two times in the past (Oktoberfest!) and found that Berlin was a lot softer than Munich (this is a good thing). The people were friendly, hip and there was so much to see and do! 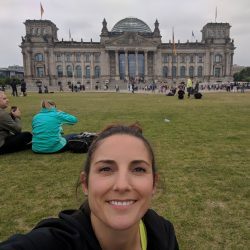 Berlin is a city with so much character and cool architecture so it was fun to just walk around and take it all in. The Graffiti was my favorite part! It reminded me of Melbourne in that respect (Click here to read my review on Melbourne, Australia). 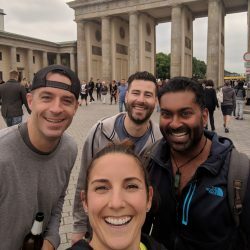 There is the obvious language barrier for Americans traveling to Germany, but I found that many people spoke English in Berlin. My advice is to learn a few handfuls of words in German so that you can attempt to speak to people in German. That way they feel more inclined to help you because at least you tried! #1 Everything closes on Sundays in Berlin so it’s the perfect opportunity to hit up Flohmarkt am Mauerpark! Take in all the cool Berlin local delicacies, art, handmade items and of course Karaoke! It is so nice on Sundays to see all of the families out and about enjoying the day! #2 Euros! 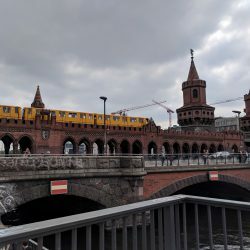 Have plenty of Euros on you in Berlin because it is a very cash heavy city. Good news is that the atm’s don’t charge you a service fee. So, if you are like me and bank with Capital One 360 who also doesn’t charge you any fees, you are golden!! #3 Pedestrians do NOT have the right of way and there is a bike lane on the sidewalk. Do NOT walk in the bike lane, they will hit you! #4 This is obvious but do NOT make any jokes about Nazis, Jews, Hitler, Holocaust etc. Berlin takes it very seriously and it will NOT be tolerated. 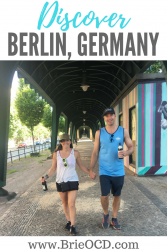 We stayed in Prenzlauer Berg and there are so many cute little outdoor markets with food and handcrafted items all made in Berlin. 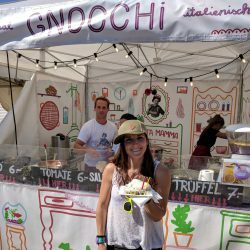 Apparently, every little town has their own outdoor markets… I LOVE that!! The one in Prenzlauer Berg is on Saturday so we headed there around noon for some lunch and to browse. I only brought a carry on for luggage and I’m not much of a shopper, so I only bought a black cuff but there were so many cute items! The food was also delicious, I got a falafel pocket and the boys got some sort of Turkish Quesadillas. 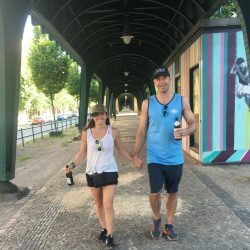 BEER: Did you know that you can have open containers on the streets of Berlin?! That made sightseeing all the more fun! We would go to the local schpaiti (convenient store) and pick up a couple brewski’s (beer) for the walk. 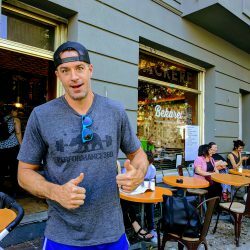 There are a ton of German beers in Berlin that sell for cheap. A ton of them are lagers and our favorite was a brand from Munchen (Munich) called Lagerbier Hell (photo below). Ooh and on the way to the outdoor market in Mauerpark we actually saw Stone Brewing! I couldn’t believe it! WINE: I didn’t drink as much wine in Berlin but it was readily available and everything tasted delicious to me. Actually, I lied. I did drink a lot of wine in Berlin but not so much out and about but rather back at Kenny & Josh’s house! Reisling is the popular wine of Germany but I didn’t see an overwhelming amount in Berlin. If you are there for 4 or more days than buy a train pass! We spent 30 euro for a 7-day unlimited pass. We were only there for 4 full days BUT it was cheaper than buying the pass daily and you got to hop on and off at any location at any time! So worth it! 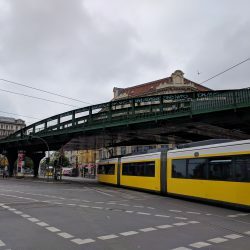 The trains are fairly easy to understand (however we had Josh as our permanent tour guide so that made it VERY easy LOL) and you can use any of the above or below ground trains with the pass. You can also catch the train to/from the airport however please note that you must buy the airport zone for an additional 2 Euroish. Also make sure you validate the ticket before getting onto the train. 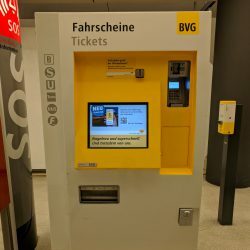 They are very strict in Germany and have regular dressed people come around checking the validity of your tickets. Don’t mess around! Suicide Sue’s – Prenzlauer Berg – We stopped by here one morning for a quick croissant and coffee. Make sure to order the croissant off the menu with jams and butter. It was cute inside but unfortunately, we didn’t have a real meal here. 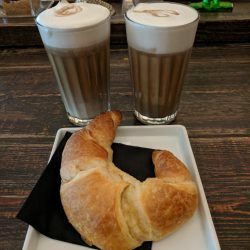 I say stop by for a quick coffee and to relax for a few and be on your merry way! 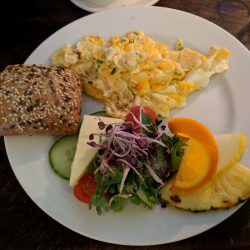 Bekarei – Prenzlauer Berg – Such a hip little breakfast spot. Wait in line, order and go find a seat outside to people watch. We stopped here on Sunday morning and it was so cool to see all the families out and about enjoying the day! 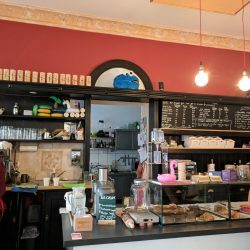 Beakers – Prenzlauer Berg – delicious breakfast and fresh Cherry juice! I would never have tried that on my own but it was surprisingly delicious! Hancy got the apple cinnamon pancakes and the rest of us all got the feta omelet with a wheat roll and fruit. So yummy! 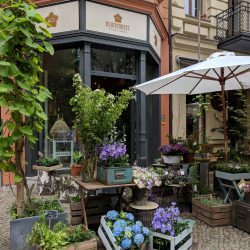 House of Small Wonder – Mitte District – This is a must! They don’t take reservations or credit cards, but it is such a cute little restaurant in the Mitte District that serves original dishes like Okinawan Taco Rice that was deeeelicious and filling! They also have cute cocktails, like the sparkling lemonade punch, that even I tried! Holzmarkt Brauerei – Hozlmarkt – We walked here after the Outdoor Street Art Gallery. It is right on the river and such a cool outdoor bar. They have craft beers for about 5 euro a piece. You must put a deposit down on glasses however you get your money back when you return the mug. We spent about an hour or so here just taking in the scenery and watching the boats go by. We wanted to stay longer but the pollen was out of control! 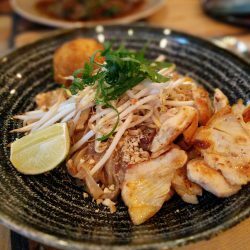 Mam Thai – Schoenhauser Allee – Such yummy thai food! The staff was so nice, and the food was delicious! We got the chicken spring rolls and garlic chili tofu for appetizers which were both delicious. Hancy and I both got the Chicken Pad Thai. The chicken was cooked to perfection but was a tiny bit salty. Kenny and Josh both got the Argentine Cattle Hip which was so tender and tasty as well. 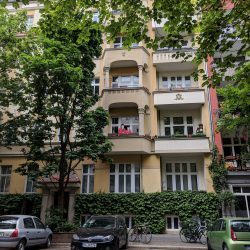 Crackers – Mitte District – This place is a little hidden gem. If you don’t know about it, you would never be able to find it. We had a delicious dinner here but beware its not cheap! We spent about $170 for the two of us. 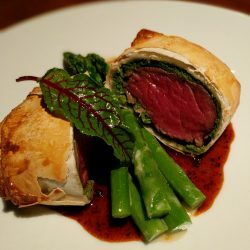 I got a fish dish and Hancy got the beef wellington which was pretty phenomenal. 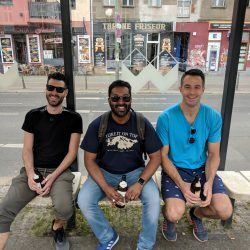 Zaika Indian – Prenzlauer Berg – This was my first authentic experience with Indian food and even though I was a weeee bit scared it was delicious! Kenny ordered for us because he is the pro, but I would say if you like Indian, you should definitely try Zaika! I Love Spooning (cookie dough bar)– Prenzlauer Berg – we ordered this raw cookie dough for delivery and it was gooooooood. Reminded me of growing up as a kid and eating it straight from the package but tastier. So many flavors and add in’s to choose from. 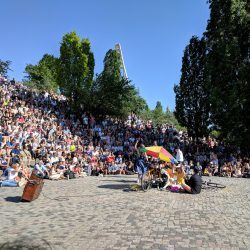 Flohmarkt am Mauerpark (flea market in Mauerpark) – Prenzlauer Berg – This is a MUST DO!!! Every Sunday there is a big outdoor market in Mauerpark and is a mix of handmade Berlin Goods, local art, flea market and entertainment. In addition to all of the delicious food and handmade goods there is Karaoke in the park grandstand! It was highly entertaining to watch with an ice cold beer. 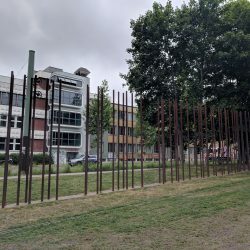 Berlin Wall – You can see what remains of the Berlin Wall all across Berlin. There are placards up that describe the different areas of the wall and history behind it. 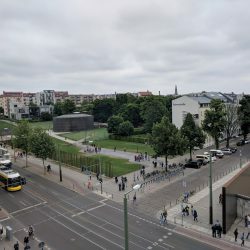 Berlin Wall Museum Memorial – Prenzlauer Berg/Mitte – Walk to the top of the tower for a clear view of both walls that were constructed. Stop inside the memorial museum to learn about the history of the wall. 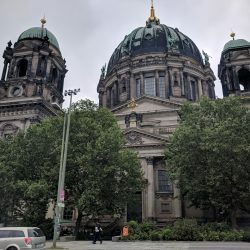 Berlin Cathedral – Mitte District – about 7 euro to gain entrance. Definitely climb the 281 stairs up to the top of the cathedral to see the awesome views! 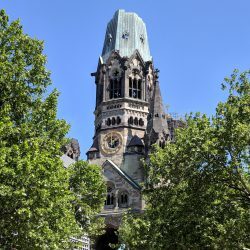 Berlin Art Fair – Mitte District – another street market with art, do-dads and so much more cool stuff. We passed it on the way from the Berlin Cathedral to the Reichstag. Reichstag – Mitte District – meeting place for the German Parliament. We didn’t go inside (but you can, just make sure to register in advance). We opted to drink a beer on the lawn and just take in the live music and scenery. Brandenburg gate & Humboldt University – Mitte District – walk by here on the way from the Berlin tower on the way to the Reichstag. 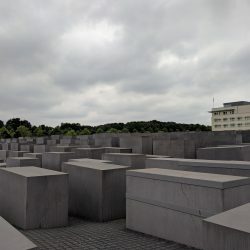 Memorial to Murdered Jews – Brandenburger Tor /Mitte District – one block south of Brandenburg Gate – This is literally just different sizes of cement blocks but WOW what an amazing memorial. 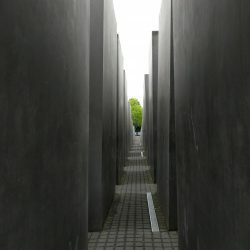 The different blocks, walkways and their mazelike confusion were meant to symbolize the jews in the concentration camp. They would be lead around in single file lines and pass other jews in the camp, see their face and never see them again. Hitler’s Bunker – Brandenburger Tor – This used to be Hitler’s hideout but is now just a parking lot. Its cool to walk by after the Memorial to Murdered Jews and look at the educational board and picture what it used to look like. 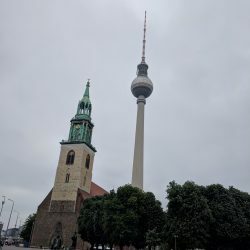 Berlin TV Tower – Alexander Platz – One of the 3 tallest structures in Europe and looks like the space needle! We didn’t go up to the top but you can for approximately 15.50 Euro. Chapel of Reconciliation – Kollwitz Platz – This church was blown up in the war and part of it is still standing. You can literally see the areas where it is half gone. This was a quick trip, we walked to it from the train station taking in the scenery and then went inside the gallery to see what it used to look like and get a little history. 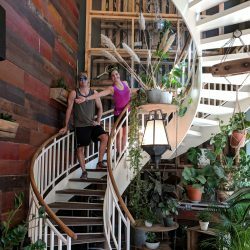 Rausch Chocolate Shop – Mitte District– This chocolate shop is awesome because of the giant structures made out of chocolate! If you have children, definitely take them here! Neuhaus Chocolate Shop – Mitte District – this is Kenny’s favorite, and I agree that the chocolate was decadent but they didn’t have any chocolate with nuts. I should’ve gotten the mixed bag at Rausch’s, but I guess next time! 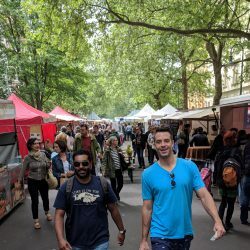 Outdoor/Street markets – Prenzlauer berg or the town you are staying – These street markets are filled with the best street food and goods. 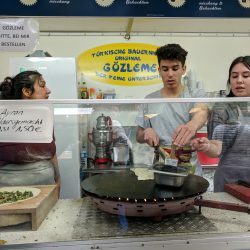 It is so fun to walk around, grab a bite and see the local items for sale. You can also grab a beer or glass of wine and either stroll around or just sit and people watch! Concentration Camp – we did not have enough time to do this but I hear its amazing but also very heavy. Be prepared to spend quite a few hours here and need a beer immediately following. You can hop on a 6-hour tour (way too long for me!) 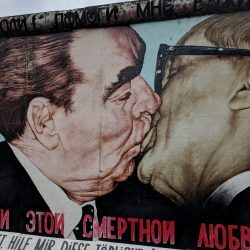 through Original Berlin Tours for 16 euro and get the full history. Outdoor Street Art Museum – Shoneberg – LOVED THIS!! This is a MUST DO!! WOWOWOW! I love street art and this was no let down. 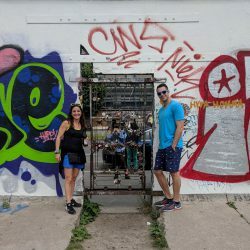 It is the largest outdoor street art gallery where artists are commissioned to graffiti their section all down the Berlin wall. After you walk the length of it, head to Holzmarkt to relax and have a craft beer (or two). Ping Pong! 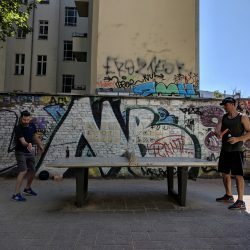 – There are ping pong tables all over Berlin! Lucky for us there was one in the park right across the street from Kenny & Josh’s. On two occasions we had a little park party and played some ping pong with beers from the Schpaiti!